The phone is very stylish look and display is very good but it&apos;s rear camera and battery backup is an average quality. 26 Pricebaba users have written their experience with Motorola M 64GB. 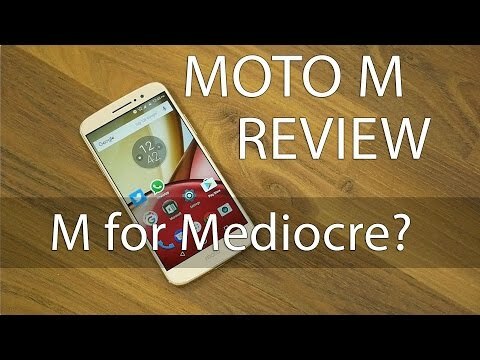 If you own Motorola M 64GB, please do leave your feedback too. Lowest price of Motorola M 64GB price in India starts at Rs. 9,998 Motorola M 64GB is available on Flipkart at Rs. 11,479 and on Amazon at Rs. 9,998. Prices updated on 26th April 2019. Lenovo announced the much anticipated Moto M recently. It is the first phone by Motorola to feature a fingerprint sensor on the rear of the device. Moto M features a metal unibody design and looks premium. It has a huge footprint of 153 x 76 x 8.3 mm thanks to the 5.5-inch display. The display has a resolution of 1920 x 1080 pixels giving it a pixel density of 401PPI which seems crisp enough to avoid pixelation. Unfortunately, there is no mention of Gorilla Glass protection by the company. On the inside, the phone sports an octa-core MediaTek Helio P15 clocked at 2.2GHz and paired along with it is an ample 4GB of RAM to ensure smooth multitasking. On the software front, as usual, Moto M is found running near stock Android making it a huge plus. It runs on Android 6.0.1 Marshmallow and is expected to receive Android Nougat update soon. Apart from that, Moto M also features a fingerprint scanner on the rear of the device for the first time. The Motorola logo is now relocated on the front chin of the phone. On the rear of the device, you will find a 16MP sensor for taking pictures and shooting 1080p videos. There is also a Dual Tone LED Flash for low light conditions and PDAF for focus. Whereas on the front is an 8MP wide angle lens that should result in better selfie and video calling experience. In terms of storage, the phone comes with 64GB onboard storage that can be further expanded up to 128GB via a microSD card. Powering the Moto M is a 3050mAh battery that is sealed inside the device and is not user removable. The phone comes with a USB Type-C port and supports Motorola's Turbo Charging technology. It also has the standard WiFi, Bluetooth and supports 4G LTE in India with VoLTE for Reliance Jio users. - No, the 3050mAh battery of the phone is not user removable. 5. How much time does the Moto M take to charge?